LOS ANGELES -- Here come the rumors. You knew, at some point, they had to come. You could feel them lurking down Addison Street alleys, behind Cubby Bear bars. You were simply waiting for the "dust" to settle, waiting for the trade deadline to pass. Waiting for that one Chicago columnist to break the rumor. You had no idea the rumor would break from the Left. "A person 'close to' Dusty Baker said..."
Something's rotten in Chicago if you think Dusty really wants to go to L.A.
Then, following that in the L.A. Times story, the words "unhappy," "wants to go," "desperately" and "if." Dusty Baker desperately wants to manage the Dodgers. He is unhappy in Chicago and wants to go to Los Angeles if Jim Tracy (the current Dodgers' manager) leaves at the end of this year. For months, damn near since the beginning of the third week of the season, the lynch mob has been out, looking for Dusty Baker to exit Chicago, stage left. GT*O. Give the Cubs and their losing ways back to the city, because this "expectation of winning and not having it happen" is taking a toll. "We can't live like this," is the attitude being painted. Jim Fregosi is never around when you need him, is he? When Dusty came to Chi, he came basically for one reason: To turn Sammy Sosa into Barry Bonds. For years, Dusty had managed Bonds masterfully in San Fran. And somehow, Baker was able to get out of Bonds -- and the Giants -- a trip to keep playing ball in October. The Cubs wanted that. The Cubs needed that. The Tribune Co. (the team's owner) made the move. "In Dusty We Trust" signs lined Wrigleyville. 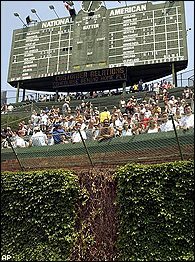 The Cubs were one Steve Bartman out away from beating the Boston Red Sox to the punch. Now, the subtle campaign to get the dude out is about to start. In a city where the motto is "Vote Early and Vote Often," the media's master plan to get Dusty Baker outta here is like a KRS classic, and it began long before the L.A. Times broke that story on Sunday. Here's where the racist in me comes out. On Sunday morning, during the "Sports Unplugged" radio show on Power 92 (92.3 FM) in Chicago, I basically "forgot about the game and spit the truth." I did the Skinny Black. "The media sets the agenda for how the public responds to nonobjective matters and to how the audience often forms an opinion on certain issues. In sports, in this town, those opinions are often -- if not always -- set by columnists. Sports columnists, not sports reporters. Reporters are nonobjective in this matter, although the editors do have 'angle control' over copy. Columnists, they are the ones who shape public opinion. Now ... how many black sports columnists do we have in this city? How many are at the Sun-Times? How many at the Trib?" None, was the answer I was given. "And what about sports-talk radio?" I looked at my two co-hosts, Leon Rogers and Steve Bardo, and asked the over-obvious question to Johnnie Cochran my point home. "Outside of the two hours on Sunday morning that we have, and outside of Jonathan Hood on 'The Score' (WSCR-AM), how many black sports-talk shows do we have in the city? What? One?"